An easy circuit for beginners in electronics that flashes an LED on and off. The circuit uses only two transistors as well as some passive components. This video shows the circuit built on breadboard and powered from a 9V battery. The circuit will operate using almost any small NPN transistors, e.g. KSP2222, PN2222, 2N2222, BC107, BC108, BC109, etc. 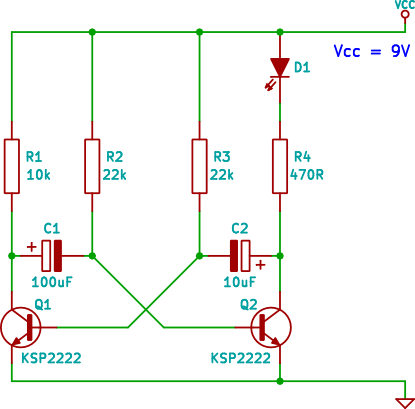 The circuit can operate from a voltage of about 5V up to 12V, change the value R4 to about 1k if using a voltage higher than around 10V.